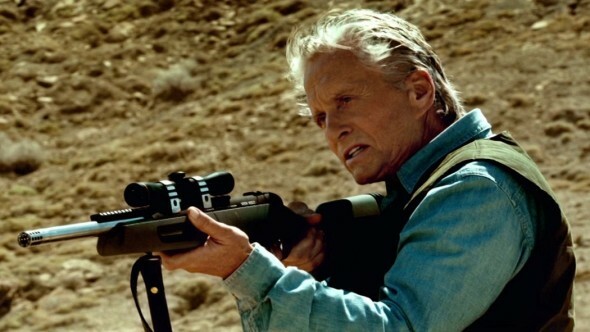 Michael Douglas continues to find intriguing ways to evolve as an actor. Now into his 7th decade on the planet, the actor has taken more and more interesting roles, generally succeeding. His Liberace in 2013’s Beyond the Candelabra marked a high point in his long career, and for his latest, the thriller Beyond the Reach, he reimagines a role originated by Andy Griffith, of all people. Douglas plays a multi-millionaire named Madec, a man who collects trophies, buying his way out of red tape and problems, no matter how dire. He finds himself in hot water when an expensive but unlicensed hunt for “big horns” goes wrong. When he suspects that his young guide may not be as easily bought as he’d hoped, he devises a particularly nasty Plan B.
Jeremy Irvine (War Horse) is Ben, Madec’s wholesome but potentially corruptible young guide. What emerges is more than a sadistic cat and mouse game, mostly because Douglas patiently unveils layers to the character that feel at once horrifying and utterly natural. It’s a straight forward thriller wisely adapted by Stephen Susco from a novel by Robb White. White was the source writer for many an exploitation flick back in the day (House on Haunted Hill, The Tingler, 13 Ghosts), and while Susco maintains the same type of urgency and thrill, his taut script is as interested in character as terror. There is something so genuine about Douglas’s performance – he’s a shark, a man who’s amassed enormous wealth through charm, savvy, and cut-throat maneuvering. His sense of entitlement is based on decades of success, success that has encouraged him to see the world exactly as he sees it here. As ugly as his behavior is, it isn’t necessarily personal. It’s survival. It’s business. Irvine handles his task capably, but it’s Douglas who makes the film worth watching. What begins as simply the clearest (if most heartless) strategy toward achieving a goal becomes, as time wears on, an old buck’s attempt to dominate the young challenger to his alpha status. Beyond the Reach is a simple premise and a simple film that could very easily have become another throwaway thriller, and though it’s certainly no masterpiece, it transcends its exploitation trappings thanks to a veteran actor who knows what it means to be a survivor. ← Does Anybody Who Remembers Laughter Still Have Their Ticket Stub?